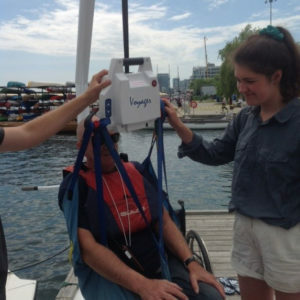 DSAO Toronto has the resources and equipment to provide assistive technology to those sailors who do not have full use or strength of their arms or hands. In these cases, a device called an “Autohelm” can be easily fitted into the boat. The Autohelm has a small joystick, similar to a video game control, that can be used to steer the boat. In addition, a windlass (winch) can also be fitted on to the boat and both sheets can then also be controlled with a touch of the fingers – left or right for steering, forward or back to adjust the sails. The boat can be further adapted using the Autohelm to be controlled by a sophisticated straw system called “Sip ‘n Puff”. As the name suggests, the sailor uses their breath to control the helm and sails. By just inhaling or exhaling gently into the straw, the rudder will move left or right and the sails can be let in or out. 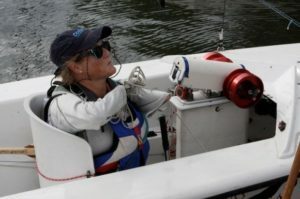 With this incredible design, high-level quadriplegics (those with no movement below the neck) can independently sail the boat.